You have a question? We have an answer that can help you! What are the weight restrictions for bags? Bags should not exceed 50 lbs. Will my pickup be delayed due to weather? Not typically. However, during times of inclement weather, you can view schedule updates for your area in our Alerts section on our homepage. What if I need an extra pick-up, or I have a large amount of garbage for pick-up? Please call our office. Extra garbage collected may result in additional charges. How do I get rid of a large item? Call office to find out options and pricing. You can drop it off at our location at 950 Nelson Parkway in Viroqua, WI. How do I get rid of fireplace and wood stove ash? Use as traction aid on sidewalks, etc. What if my pickup day falls on or after a holiday? Your pickup will be on the next business day, with the exception of Friday routes. 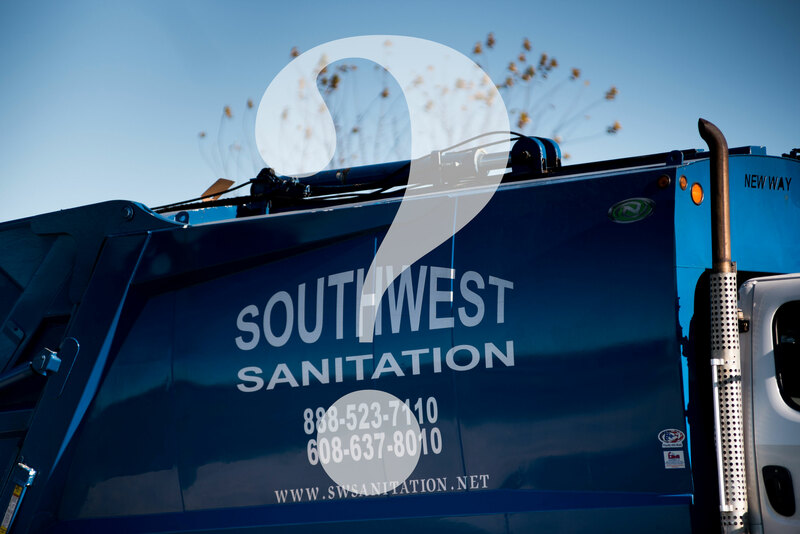 Which holidays do Southwest Sanitation observe? What counties do we service? Where can I find the pick-up schedule for my location? Calendars are not available online for subscription customers. These are custom schedules. Call or email us if you are a current subscription customer and need a new calendar. What if my scheduled pickup falls on a holiday? How much are dumpsters to rent? The price varies on size of container and frequency of service, so please call our office. How long can I keep a temporary dumpster or roll-off? Typically 2 weeks; then you call us when finished. How Do I Get A Print Schedule of My Pick-Up Trash and/or Recycling Day? Call our office OR find municipal schedules here.